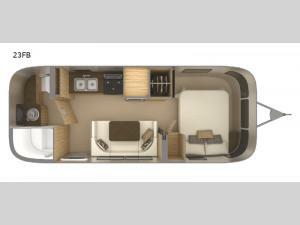 A rear bath layout, plenty of room for your family to enjoy any camping trip, and a u-dinette are what make this 23FB Flying Cloud the model of your dreams! All of the kitchen amenities are located along the roadside wall. Here you can easily prepare your favorite meals with a three burner range, microwave, and clean-up is easy with the double sink. In the front bedroom there is a queen bed, and throughout this model you will find storage space with the wardrobe, overhead cabinets, and nightstands.